Reference number for this case: 26-sep-54-Croix-de-Nivollet. Thank you for including this reference number in any correspondence with me regarding this case. To date, Dr. Martinet, dermatologist in Chambery, attached no importance to the "flying saucers, cigars" and other devices of the same kind. Methodical, and careful observer, he did not believe! But as recently as last week, a social worker stated that told him she had seen in the sky of Bourg-Saint-Maurice a superb flying saucer, he answered with a shrug! Former artillery observer, Dr Martinet conducted his observation objectively and knowingly and the report he proposes to submit to the prefecture will be more detailed. But here are the facts: "It was around 5 p.m., we were returning by car from the Col du Chat, when suddenly saw above the Croix du Nivollet at around 2000 meters and on the edge of the hazy area, a dark grey aluminum mass. Having exceeded the air base, I stopped my vehicle. Three other cars did the same, and we followed with our eyes the maneuvers of the saucer. First I thought of a rainstorm, but the wind blew from the Northwest and the phenomenon came from the south! 30 seconds later, when we were fifteen people to observe the machine, it went down like a dead leaf, then appeared in the form of a soup plate, whose relief was facing up, then upfront as a perfect disc. We observed that a clearer area occupied the center of the disc, and dark spots were all around. After that, the saucer came directly below the cable car station of Revard, went down a little, then suddenly disappeared like lightning! According to the observation angles, it changed color from aluminum gray to a very dark to lighter gray. At 5:19 p.m., it disappeared, the phenomenon lasted a little over four minutes, which allowed me to set on a notebook, the various steps of its maneuvers, and minute it..."
The Doctor then presents the diagram of the tormented path that the saucer followed, and let's not say anymore to Dr. Martinet and the fifteen witnesses who observed the phenomenon that the saucers are just fluff! LYON. -- In the departments of the Rhone, Isère, Drôme and Savoy, many people claim to have seen, these last days, with more or less clarity, craft having either the shape of cigars, or those of discs. In the area of the Arbresle, one of these witnesses, director of a music-hall, stated to have filmed one of these mysterious apparatuses which evolved at a height estimated by him as of approximately 700 meters. One will thus know, after development of the footage, if it was or was not an optical illusion. Close to Feyzin (the Isère) a young man is said to have seen in the countryside, not far from the ground, a machine having the shape of a dome from where spouted out a very sharp light. The witness had compared it with that caused by the combustion of magnesium. The craft, suddenly, went up vertically while leaving a shower of sparks and disappeared. Inhabitants of Chabeuil stated to have seen a flying saucer evolving above the countryside. Lastly, in Savoy, close to the lake of Le Bourget, above Mount Revard, several motorists, on the whole about fifteen people, simultaneously saw an apparatus having the shape of a disc, that evolved during approximately four minutes, to then disappear suddenly. One of the witnesses, a doctor of Chambéry, is a former artillery observer. He carefully wrote up the observations and drew a diagram reproducing the travel of the mysterious apparatus. REDON (Ille-et-Vilaine). -- Misters Gérard, mechanic, and Paroux, driver, who operated a wildcat engine coming from Nantes, saw, whereas they passed at the locality "La Butte Rouge", community of Saint-Nicolas-de-Besson (Ille-et-Vilaine), a machine which rose from the nearby marshes. This craft, of a certain length, which was followed of a luminous trail, flew during ten second above the machine and disappeared in the sky. While the mechanic preserved all his calm, the driver, on the other hand, was so frightened that he fell sick and had to pass a medical examination yesterday morning. LA HAYE. -- The aerial phenomena which currently appears above Europe did not fail to visit the Netherlands. Among the recently reported testimonies on the passage of flying saucers above the Dutch territory, it is necessary to quote that of a citizen of Schiedam (an important center of juniper production) which claimed to have seen a rather large object, circular and luminous, moving towards the west. Its fiancée who accompanied him corroborated his statements. Less recent but more impressive, is the account of the captain of "Grote Beer" Mr J.-P. Boshoff, of the Holland - United States line. The object detected on the open sea and observed by himself and his five officers using all the optical equipment on board, was the "size of a half-moon" and also circular and luminous. The captain adamantly excluded the possibility that it can be a weather balloon. Initially motionless, the disc, after a few moments, moved towards the west to disappear behind the clouds at an altitude of approximately 14.000 meters. Doctor Martinet, a dermatologist in Chambéry, considered to be a methodical, observant and balanced mind, did not believe until last week in the existence of flying saucers. And he shrugged every time he was told about these mysterious machines. Former observer of artillery, with the rank of captain, the physician has just been struck by an observation of which he entrusted us in detail. He also sent a copy of the report which will follow, with evem more details, to the prefecture of Savoy. "It was about 5:12 p.m. last Sunday (September 26). "My family and I were returning by car from the Col du Chat, above Aix-les-Bains, when suddenly I caught sight at the Croix du Nivollet, about two thousand meters of altitude, at the limit of the foggy zone, of a gray aluminum mass. "I stopped my vehicle, and three other cars followed me did the same and we followed the evolutions of the "saucer." It was then 5 hours 14 minutes 30 seconds p.m..
"First of all, I thought of a whirlwind, but the wind was blowing from the northwest and the phenomenon came from the south. "Thirty seconds later, when we were about fifteen people watching the saucer, it came down in "falling dead leaf" manner and then presented itself in the form of a hollow plate whose relief was turned upwards. "At last, at 5:16 p.m., when it presented itself from the front, that is to say, in the form of a perfect disc, we could see that the lighter part occupied the center of the whole and that dark spots were all around. "After that, the saucer came in line with the station of the Revard cable car, descended a bit then suddenly disappeared like a flash. "According to the angles under which we observed it, it changed color, going from the dark gray to the lighter gray. "It was exactly 5 hours 18 minutes 40 seconds p.m. when it disappeared. "The phenomenon lasted a little more than four minutes, which allowed me to record on a notebook the different steps of its maneuvers and to timing them." The doctor made a sketch of the tormented trajectory the saucer followed. A sketch he communicated us with his descriptions. It was night in Montecreau -Villebois-Lavalette (Charente) when Mr. Jean Allary, 22, saw by the light of the headlight of his motorcycle, a kind of 1.80-meters-high barrel and nails of golden nails! It swung on the roadside and fled when the witness approached. The next day, at the place indicated by Mr. Allary, witnesses spotted traces of about seven meters in length in the grass by the roadside. Flying saucer stories originated in the United States, spread to Canada, and have now burst out in France. The French saucer tales have a gallic quality that adds to their fascination. Then a former artillery officer in France reported he saw a dark-gray object hovering over some mountains at about 6.000 feet. As he stopped his car to look, the mass sudeenly "shot away like lightning and disappeared." The element of ramce is missing here, but not that of wonder. It's impossible to say that flying saucers don't exist; certainly stories about them appear to be universal. But so, at one time, did stories of witches and fairies come from all over the world. What is universal today is the jitters. It may be these, along with the fantastic devices assembled by science, that cause people to see things in the sky which exist only in their imagination. Flying saucers stories originated in the United States, spread to Canada, and have now burst out in France. The French saucer tales have a Gallic quality that adds to their fascination. Then a former artillery observer in France reported he saw a dark-gray object hovering over some mountains at about 6000 feet. As he stopped his car to look, the mass suddenly "shot away like lightning and disappeared". The element of romance is missing here, but not that of wonder. It's impossible to say that flying saucers don't exist; certainly stories about them appear universal. But so, at one time, did stories of witches and fairies come from all over the world. What is universal today is the jitters. It may be these, along with the fantastic devices assembled by science, that cause people to see things in the sky which exist only in their imaginations. 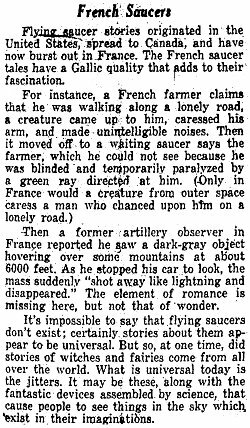 The author indicates that in 1954 in France, a doctor from Chambery and 15 witnesses say they saw a "flying saucer circus" in the skies over Lyons. Wilking notes that the expression presumably means a fleet of UFOs. The doctor said what he saw was a dark grey mass hovering over a 6,000 feet high mountain. When it lost height, it looked like an inverted plate, light in color with darker patches. In the Ouranos report on the case in Chabeuil on the same day, this case is mentioned as maybe related to the Chabeuil case. Underneath are the extracts of the related Ouranos report. The witness of Chabeuil, Mrs Leboeuf, heard of the case and mentions it in her statement, and the authors of the Ouranos report specify that it was later in the afternoon (02:30 P.M. versus 05:12 P.M.). Aimé Michel indicates that the witnesses were Doctor Martinet, dermatologist of Chambery and formerly artillery observant, his wife, three trainees of the air base of Le Bourget-du-Lac, and the occupants of three car, the whole group amounting to about fifteen people. "It was approximately 05:12 P.M.. We were returning by car from the col du Chat [pass of the Cat], when suddenly I saw at an apparent location of above la croix du Nivolet, at an altitude which I evaluated of 2000 meters, at the limit of the foggy zone, an aluminium gray body. Having driven past the air force base of Le Bourget, I stopped my vehicle, the three others did stop too, and we followed the evolutions of the object. It was then 05:14:30 P.M.."
"First of all, I thought of some atmospheric phenomenon, such as a cloudburst etc. But the wind blew from the North-West, and the phenomenon came from the South. Thirty seconds later, whereas we were about fifteen people to observe this object, it started to go down in a falling leaf manner, offering the aspect of a plate whose relief had been turned upwards. At 05:16 P.M., it suddenly presented itself upfron in the shape of a perfect disc. After that, it came to the apparent vertical location above the cablecar station of Revard, went down a little, then suddenly accelerated and disappeared as fast as a thunderflash. It was exactly 05:18:40 P.M."
These American authors note that on September 26, 1954, in France, half an hour after Madame Leboeuf's encounters, witnesses at Col du Chat, 65 miles northeast of the place of her sighting in Chabeuil, saw an object arrive at that location. September 26, 1954, Col du Chat, France. Fifteen people saw a disc like an "inverted plate" that was descending "like a falling leaf." "It was approximately 05:12 p.m., we were returnin from the Pass of the Cat (Col du Chat) when I suddenly saw above Croix du Nivollet, at an altitude of 2000 meters, at the limit of the foggy area, an aluminum gray body. After the Bourget air base, I stopped as well as the occupants of the other cars, it was 105:14 30 seconds p.m.; thirty seconds later, the object started to go down like a falling leaf, offering the aspect of a plate whose convex side had been turned upwards. At 05:16 it was facing us, in the shape of a perfect disc. In the center of the machine, a clearer zone and dark spots around. Then it went down suddenly, accelerated and disappeared in a split second. Depending on the observation angle, the object changed from dark gray to clear gray." "This testimony is one of most precise there is. Its narrator, whose good faith and the perfect operation of the wristwatch cannot be questioned, the significant number of witnesses result that in this case we have to the perfect elements to analyze this UFO..."
Further in the book, they add that according to France-Soir for October 1, 1954, "a balloon was indeed observed". About the sighting by Dr Martinet, it is really 05:12 p.m., 05:14 p.m. or 05:18 p.m. according to the different newspapers of the time. These authors indicate in criticism of an article by Michel Figuet that Dr. Martinet made his observation at 05:12 p.m. or 05:14 p.m. or p.m. 05:18 p.m. according to France Soir of October 1, 1954 and their investigation on the location on February 20, 1977. The authors say that the explanation is that he had seen a balloon, also seen in many departments such as Savoy and Drôme in cases which they investigated. They add that France Soir of October 1, 1954, dates the case as September 29, 1954, and that this case is variously located depending to the sources as at "col du Chat", "croix de Nivolet", "Challes les Eaux". 1954 - A disc-shaped object maneuvered around the sky and then hovered over a radio station on a mountain peak in Col-de-Chat, Savoie department, France at 5:14 p.m. There were 15 witnesses, and the sighting lasted at least 4 minutes. A photograph was taken. (Sources: Thomas M. Olsen, The Reference for Outstanding UFO Reports, case 50; Aime Michel, Flying Saucers and the Straight Line Mystery, p. 81). Luc Chastan indicates in his database that in Savoy in Le Bourget du Lac on September 26, 1954 at 17:12, "The witnesses are Doctor Martinet, dermatologist of Chambéry and former artillery observant, his wife, three pupils of the air base of Le Bourget-du-Lac, and the occupants of three cars, the whole group amounting to about fifteen people." "'It was approximately 17:12. We returned by car from the Pass of Le Chat, when suddenly I saw at the apparent zenith of the cross of Nivolet, at an altitude I evaluated as 2000 meters, at the limit of the misty zone, a gray aluminum body. Having exceeded the air base of Le Bourget, I stopped my vehicle, the three others did the same, and we followed the maneuvers of the object. It was then 17:14 mn 30 s.'"
"'Initially, I thought of some atmospheric phenomenon, such as a cloudburst etc. But the wind blew from the Northwest, and the phenomenon came from the South Thirty seconds later, whereas we were about fifteen people to observe this object, it started to go down in falling leaf motion, offering the appearance of a plate whose bump had been turned upwards. At 17:16, it suddenly presented its front in the shape of a perfect disc. After that, it came to the apparent zenithof the cable car station of Revard, went down a little, then suddenly accelerated and disappeared like a thunderflash. It was exactly 17:18 mn 40 s. Depending on the angles of observation, the object passed from a dark gray aluminium to a clearer gray. The phenomenon had lasted a little more than four minutes, during which I noted all its complicated displacements on my notebook.'" The sources are indicated as "UFOs at Close Sight by Gross Patrick ** http://ufologie.net" and "M.O.C. by Michel Aimé ** Arthaud 1958". The website indicates that on 29 September 1954 at 17:15 in Chambery, France, "Hovered. A hovering object was observed. A daytime disc was observed by 15 witnesses for over four minutes." The source is indicated as Del Valle [sic, Delval], Pierre, Pierre Del Valle investigation files, Bordeaux. The website indicates that on 29 September 1954 at night in Lyon, France, "Doctor incident." And: "Fleet of large dinner-plate shaped discs, silver with dark spots on sides. A flying disc was observed. One silver disc was observed by over 16 witnesses in a city." *Sep. 26, 1954 - A disc-shaped object maneuvered around the sky and then hovered over a radio station on a mountain peak in Col-de-Chat, Savoie department, France at 5:14 p.m. There were 15 witnesses, and the sighting lasted at least 4 minutes. A photograph was taken. (Sources: Thomas M. Olsen, The Reference for Outstanding UFO Reports, case 50; Aime Michel, Flying Saucers and the Straight Line Mystery, p. 81). Source: “Mystérieux Objets Célestes”, book by Aimé Michel, Seghers publisher, France, pp 115-117, 1958. The comment of debunkers Bartel and Brucker is quite stunning. The totality of their book is devoted to the idea that there is strictly nothing of interest or truth in the entire French UFO flap of 1954. It is particularly telling that whereas they repeatedly claim that ufologists that they call "gullible" do not document the sightings properly, omitting the sources and the dates, they themselve here and elsewhere also do not provide anything more than Dr. Martinet's say. They provide no date, no source, and none of the other information which makes indeed this case very interesting. Lastly, isn't it frankly amazing that, since they estimate that we "have the perfect elements to analyze this UFO" they provide nothing else as an analysis than the "..." which follows this statement, and, further in the book, their judgement that it was a balloon, as in two other quite different cases with different dates. Not looked for yet. It has been suggested it might habe been a flock of birds. [lm1] Article in the regional newspaper Le Méridional, France, September 30, 1954. [---] Article in the foreign newspaper Auckland Star, Auckland, New Zealand, October 1, 1954. [th1] Article in the foreign newspaper The Terre Haute Tribune, Terre Haute, Indiana, USA, page 4, October 17, 1954. [be1] Article in the foreign newspaper Bridgeton Evening News, Bridgeton, New Jersey, USA, October 20, 1954. [hw1] "Flying Saucers Uncensored", book by Harold T. Wilkins, Pyramid Books publishers, USA, page 55, 1954. [ou1] "Rapports d'enquêtes sur l'observation d'un Ouranien le 28 septembre 1954, à Chabeuil (Drôme)", ("Investigation reports on the observation of an inhabitant of the skies, on Sept. 28 in Chabeuil (Drôme)"), in the ufology magazine Ouranos, pp 19-20, #13, 1st quarter, 1955. [am1] "Mystérieux Objets Célestes", book by Aimé Michel, Seghers publisher, France, pp 115-117, 1958. [---] "The Reference for Outstanding UFO Reports", by Thomas M. Olsen, UFO Information Retrieval Center, case 50, 1966. [bb1] "La Grande Peur Martienne", book by Gérard Barthel and Jacques Brucker, Les Nouvelles Editions Rationalistes éditeurs, France, pp 154-155, 1979. [mf2] "Flux et Reflux", answer by Michel Figuet to Barthel and Brucker, in the mail section of the ufology magazine Lumières Dans La Nuit (LDLN), France, #198, page 35, October 1980. 1.1 Patrick Gross June 8, 2010 Addition [be1]. 1.2 Patrick Gross July 7, 2010 Addition [ud2]. 1.5 Patrick Gross October 20, 2016 Additions [dl1], [bb2]. 1.6 Patrick Gross January 19, 2017 Addition [er1]. 1.7 Patrick Gross February 9, 2017 Addition [ub1]. 1.8 Patrick Gross February 10, 2017 Addition [er2]. 1.9 Patrick Gross September 21, 2017 Addition [th1].